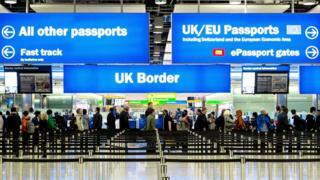 The number of EU citizens moving to the UK has continued to decrease over the last year, figures show. EU net migration was 87,000 in the year to the end of March 2018, returning to a level last seen in 2012, according to Office for National Statistics data. Overall net migration, the difference between the number of people coming to live in the UK for at least 12 months and those leaving, was 270,000. The government wants to cut overall net migration to below 100,000. Some 226,000 EU citizens came to the UK and 138,000 EU citizens left in the year to the end of March. "Much of the recent fall is in people from the western European countries that make up the 'EU15' group coming to the UK for a definite job," said ONS statistician Nicola Rogers. Separate data from the Labour Force Survey for April to June 2018, shows there were 86,000 fewer EU nationals working in the UK than a year earlier. Of those, the proportion of people aged from 16 to 64 years who were in work was 83.1% for EU nationals, higher than that for UK nationals (75.5%) and non-EU nationals (62.9%). Meanwhile, the number of non-EU nationals working in the UK rose by 74,000 to 1.27 million.